It’s time for a virtual visit to Brazil. Brigadeiros are a mandatory sweet delicacy at children’s parties, especially birthday parties, but they’ll put a smile on folks of all ages, at any celebration. At a typical Brazilian birthday party hundreds of brigadeiros surround a beautiful cake in the center of a huge table. Tropical Miss Manners states that brigadeiros should be enjoyed AFTER the cake, and until then they’re part of the party decor, but by age 5 each Brazilian has already developed his or her unique style of discreetly stealing a few. My Dad – whom I’ve already praised for his expert kitchen thievery (in stealing pasteis ) – used to slowly circle the table while pulling his white handkerchief from his pants as if to anticipate a sneeze. With a quick but quite elegant move, two or three brigadeiros disappeared into the handkerchief, adeptly pocketed for his later enjoyment while he was away from the other guests. Remembering these little gems, it’s not surprising that we all had a difficulty waiting for the candles to be blown. Place all ingredients in a heavy bottomed saucepan (preferably enamel coated, but not absolutely necessary). Cook in medium heat until the butter melts, reduce heat to low and cook, stirring, until the mixture starts to pull out of the bottom of the pan. It should take between 10 and 17 minutes. If the mixture starts to boil too furiously, reduce the heat or remove the pan from the burner for a minute or so, always stirring. Allow it to cool until you can handle it. It is OK to put it in the refrigerator to speed up the process. Place the chocolate sprinkles in a shallow dish. Have a small dish with cold water to dip your fingers and moisten the palm of your hands. Using a teaspoon, grab portions of the cool chocolate mixture and roll into balls. Immediately roll them in chocolate sprinkles and place in a small paper cup. Makes 24 brigadeiros. Scale up the recipe for large gatherings. Comments: Rolling brigadeiros kicks off the party. Usually a bunch of women sit together at a table working in factory-like style. When I was a young child, I recall feeling jealous of my sisters, because being older than me, they were allowed to “enrolar brigadeiros,” whereas my job was to painfully open and prepare the little paper cups. It seemed so unfair! But, they were democratic as far as eating the misshapen ones: I always had my share when all was said and done… or should I say “when all were rolled and done?” ;-). 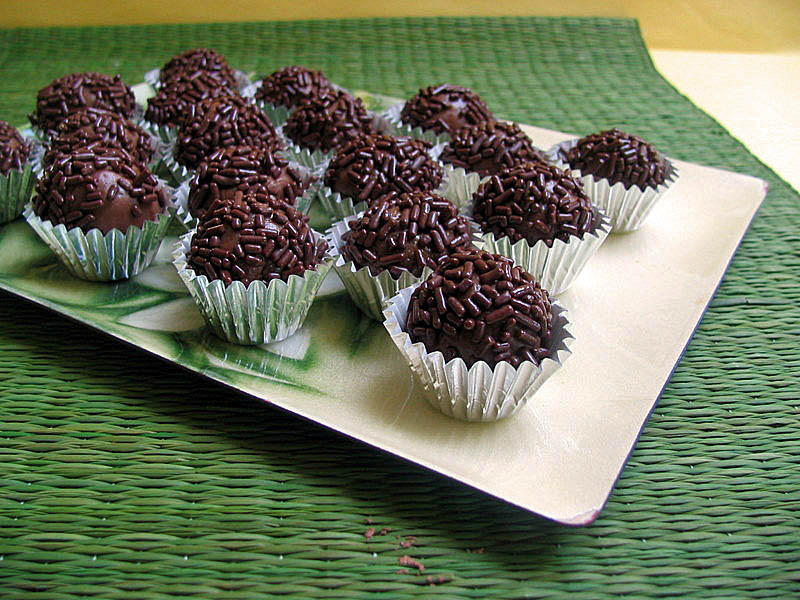 As you may have already gleaned from the recipe, brigadeiros are not just about chocolate. The sweetness and smoothness of the condensed milk cooks down into a retro, fudgy texture that you won’t forget! « ANCHO-CHILE MARINADE: PLEASED TO MEAT YOU! I could easily pop a few of these delectable little morsels in my mouth. They look pretty! I am hacking my brains….. so far, got nothing!